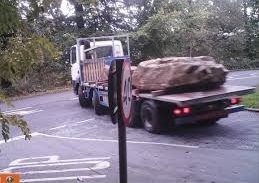 Stancliffe Stone have given up trying to get planning permission to import stone to Stoke Hall Quarry in Grindleford, which would significantly increase heavy lorry traffic through the village. This marks the end of a long campaign against Stancliffe illegally intensifying their processing operations at a linked set of locations including Stanton Moor, Rowsley and Stoke Hall at Grindleford. The quarry at Grindleford is located in a sensitive area in the national park, and accessed via a dangerous road junction. Permission currently exists to extract and export stone from the site, but not to import stone from elsewhere and cut it up for redistribution. Stancliffe Stone installed wire saws at the quarry in 2012 without planning permission, causing much unauthorised lorry traffic. The quarry still has permission to extract high quality gritstone for important local and regional building projects but the new plans would have turned the quarry into a regional processing centre, causing much more heavy lorry traffic. “We are supportive of local quarries and the jobs they provide when there is an established need for the stone” added Andy “but Stancliffe’s plans were a step too far for a sensitive location in the National Park”.